UK's Lowest Price. Do you need an autoloader that can hold up to the pressures of your high volume 24/7 work environment? 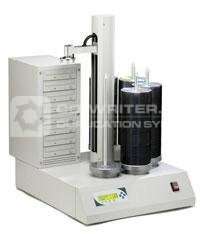 The DUP-08/1000 is an Industrial Strength large capacity robotic CD/DVD autoloader duplicator. When your business requires the added edge in overnight continuous duplication with the highest degree of reliability and functionality, the DUP-08/1000 is the answer. This unit is the most robust in our line of autoloaders and is specially designed to perform under the most grueling of continuous duplication conditions. With a revamped robotic arm and spindles that never need to be realigned, the autoloader will provide years of faithful continuous operation. The 08/1000 offers all the exceptional abilities of our DUP series with a more modular design for easier hardware upgradeability and maintenance in the future. Meaning, any upgrades, modifications, or repairs can be performed quickly and easily so that the unit is back in production with minimal downtime. The DUP-08/1000 comes with 1000 disc capacity and 8 drives to maximize your production. Complete Standalone Operation: No PC required to operate the duplicator. Maximum 1000 disc capacity Improved Multi-Master Recognition Technology (MMRT): Can load multiple masters at once to run multiple duplication jobs in succession. In addition able to load the master content to HDD while copying first run of discs. Improved Upgraded sticky me dia separator & handling option: Higher probability to separate sticky media. Provides additional setting "Detect Sticky Media" to stop the job when 2 or more media are detected in any tray. New Support automatically writer disable feature when specified "Maximum Failures/Per Recorder" is reached. New Support automatically job abort feature when specified "Maximum Total Failures" is reached Support automatically eject and close the tray when the media wasn't properly placed. Auto-Copy feature: System starts duplication process automatically by assuming the 1st disc in the input spindle is the master disc and remaining are the blanks. New Supports Manual Duplication Mode. New Dynamic Hard Drive Partitioning: The HDD partitions are created with flexible partitions that can be used in combination to match the size of the project being stored. This process saves space and allows for more projects to be stored on the HDD. New Supports all common CD Formats with Additional Special format including CD-TEXT, CD+G, ISRC, Over-Burned CD. 1000 . Tower . Duplicator . DUP-08 . Autoloader . Primera .